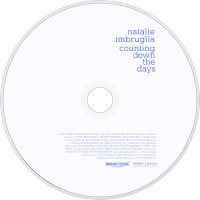 Counting Down the Days is the third studio album by Australian singer Natalie Imbruglia released by Brightside Recordings in the United Kingdom on 4 April 2005. The album included the two singles "Shiver" and "Counting Down the Days". The album entered the United Kingdom charts at #1, selling over 40,000 copies in its first week and becoming her highest charting release there. It is certified Gold in the UK and has sold approximately 600,000 copies worldwide. To dismiss Natalie Imbruglia's new album as 'Indie-lite by numbers' seems a little unfair, especially as it boasts the winter-dispelling joy that is "Shiver". The temptation to do so is strong though, but luckily, it's weighed against the fact that this album packs at least more than one eyebrow-raiser. Don't expect any experimental brain-busting instrument-wracking though. "Counting Down The Days" has about as much edge as Westlife in bubblewrap Tuxedo's. What it does have is a rather nice selection of bright and breezy songs of the guitar pop persuasion. And for quick and easy access, Nat has split these into two styles; there's the ever-so-slightly-shy-of-upbeat ones like "I Won't Be Lost" and "On The Run", and then there's the one-notch-more-upbeat of well, everything else ("Shiver", "Satisfied", "Perfectly", "Come On Home"). Oh, and then, all on its own in the 'What the...' corner (think of it as a 'bonus' bonus track), there's "Honeycomb Child" - which is simply magical in a tingly, ice cream van jingle way. And for those of you asking "Yes... and?" Well, what's important to remember here is that if you liked "Shiver" a LOT, the chances are you'll enjoy most of this almost as much. It's not all EXACTLY the same (On "Sanctuary" Nat even goes a bit ROCK! ), but generally, the jangly guitar and Nat's lovelyway with a tune are very much the order of the day.